This clichéd movie would be far better set in the 80’s, as opposed to the 21st century and stars Seth Rogen as Ronnie, a tough yet stupid security guard at a local Mall. His team of “elite” dropkicks includes two slightly overweight twins and his right hand man, Dennis (Michael Peña) who plays a sleazy looking Hispanic as they enforce justice in the mall. Their role of course is to ensure that the Mall does not fall prey to shoplifters, graffiti artists and skateboarders and of course a healthy dose of humour and innuendo are thrown in for good measures. The main character is Ronnie who has the hots for one of the staff in the makeup area of a department store. Of course, she has no interest in Ronnie and to compound the situation, Ronnie lives with his drunken mother. Our little redheaded psychopath Ronnie, soon meets in his match in Detective Harrison (Ray Liotta) who is investigating a string of crimes at mall, that includes a peeping tom and overnight burglaries. Ronnie hampers his investigation as he wants to become the hero in his town and you’re pretty much already know how it’s going to end from their. Of course both bump heads like bulls and to add another clichéd twist to the story, Ronnie is obliviously to the flirtings of a worker in a coffee store. Unfortunately the flow of comedy ranges from gut bustingly funny to horrendous and Rogen seems a little lost as this disgruntled security guard with a large “L” for loser tattooed on his head. 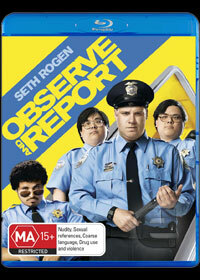 Ultimately, Observe and Report has a few moments of entertainment value, however in the end, it seems too forced and contrived to be truly enjoyable. Better as a rental than a buy!